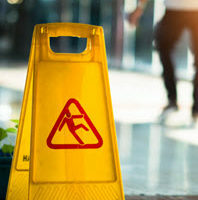 A dangerous slip and fall accident can happen almost anywhere, including at a school in South Florida. Slips and falls can cause serious injuries to students, as well as to teachers and other employees at the school. Generally speaking, school administrators and employees have a duty to be aware of slip, trip, and fall risks and to take preventive measures. What are some of the particular slip and fall risks affecting certain employees? And what can be done to prevent students from getting hurt in a slip, trip, or fall accident? We have collected information from a fact sheet from Self Insured Schools and a fact sheet from the University of St. Andrews to provide more information about slip and fall prevention in school settings. What can administrators, teachers, and other employees do to prevent students from getting hurt in a slip and fall accident at school? Administrators should implement training procedures so that teachers and other staff members know how to identify slip and fall risks as well as how to report them. If you were injured in a slip and fall accident at a South Florida school—either as a student or as an employee—you should speak with a West Palm Beach premises liability lawyer about your case. Contact Lesser Lesser Landy & Smith PLLC today for more information.